3-D WorldRunner (とびだせ大作戦, Tobidase Daisakusen?) (Full title: The 3-D Battles of WorldRunner) was developed by Square in 1987. In Japan, the game was released on the Famicom Disk System as Tobidase Daisakusen, and was published by DOG, a now-defunct label of Square. The North American release, which was the first Square game to reach American shores, was published by Acclaim Entertainment, Inc. for the NES. The gameplay can best be described as an attempt to merge Super Mario Bros. game mechanics with Space Harrier's third person perspective. 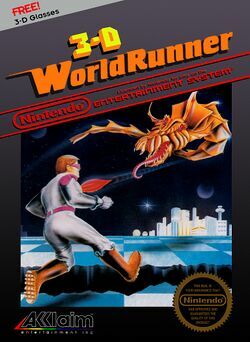 In the game, the player assumes the role of WorldRunner (known in Japan as Jack), a wild "space cowboy" on a mission to save various planets overrun by serpent-like beasts. The game takes place in Solar System #517, which is being overrun by a race of aliens known as Serpentbeasts, who are led by the evil Grax. As WorldRunner, the player must battle through eight planets to destroy Grax. For its time, the game was technically advanced; the game's three dimensional scrolling effect is very similar to the linescroll effects used by Pole Position and many racing games of the day. 3-D WorldRunner was designed by Hironobu Sakaguchi, Nobuo Uematsu, and Nasir Gebelli, all whom would later rise to fame as core members of the team behind the popular RPG Final Fantasy. The three also developed JJ - Tobidase Daisakusen Part II, the sequel to 3-D WorldRunner. Part of the appeal and selling point of 3-D WorldRunner was its "3-D mode," and it was the first of three games by Square to feature such an option (the other two being JJ, the sequel to 3-D WorldRunner, and Rad Racer). When the 3-D mode is selected, the game uses computer image processing techniques to combine images from two slightly different viewpoints into a single image, known as anaglyph images. The game was packaged with cardboard "anaglyph glasses," which use red and cyan color filters to moderate the light reaching each eye to create the illusion of a three dimensional image. This page was last edited on 2 March 2016, at 02:31. This page has been accessed 10,566 times.